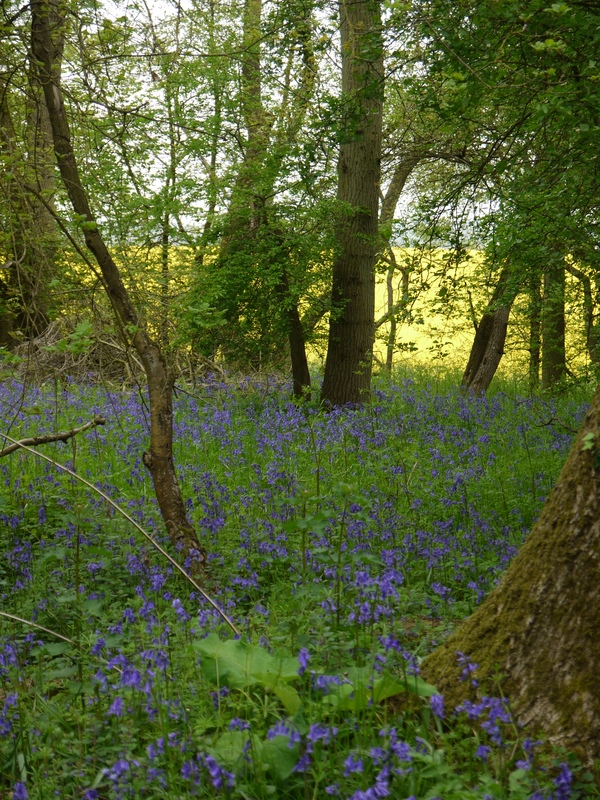 As my May blog ended rather abruptly I feel compelled to post an addition along with extra photographs, particularly of the contrasting glimpse of the bright yellow rapeseed beyond the wood. It added to the wonderful “assault on the senses” from the bluebells. Roughly translated it means we’re in for light rain during the summer if oak leafs first. 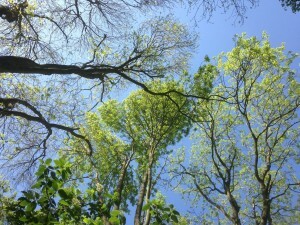 If ash leafs first we’re in for a wet summer. Amusingly, German folklore states completely the opposite. Oak is particularly temperature sensitive and the leaves will open earlier if we have a warm, early spring. It’s thought that ash responds to hours of daylight rather than temperature, therefore if it’s a cold April with plenty of sunlight the ash will leaf first (known as leaf out). Due to climate change, we generally have warmer springs so oak is now often reported to be out before ash. There is a great deal of scientific interest in changing leaf out times as it will have a huge effect on many ecological processes. We noted the 3 nearby mature ash trees, Fraxinus excelsior, all of a similar age and size but in very different stages of leaf. There are significant differences in leaf out times both within and among species but the mechanisms for this are so complex it’s still not completely understood. Known reasons include the length of daylight hours, temperature, genetic diversity and stem differences. 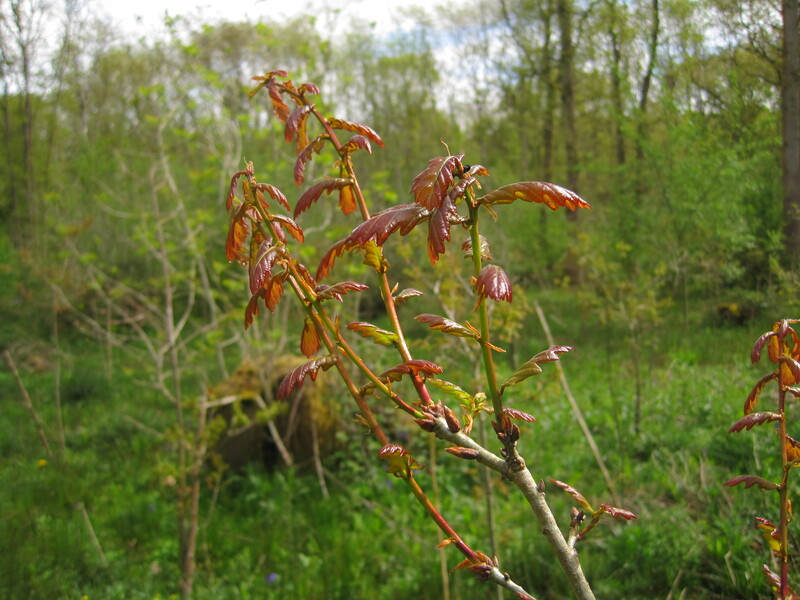 We also noticed the first flowers of the common hawthorn, Crataegus monogyna, just beginning to open. There can’t be many of us (particularly of a certain age) who haven’t heard the saying ‘Ne’er cast a clout till May is out’, thought to mean summer hasn’t arrived until the hawthorn is in flower. Most of the hawthorn flowers were in bud with only the occasional twig in full flower. As the flowers were typically used in May Day celebrations it would seem hawthorn is late flowering in Hollington this year. 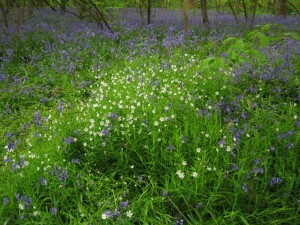 The pink herb Robert, Geranium robertianum, was also scattered amongst the bluebells on the north side. So many that Philip named one area ‘geranium city’. 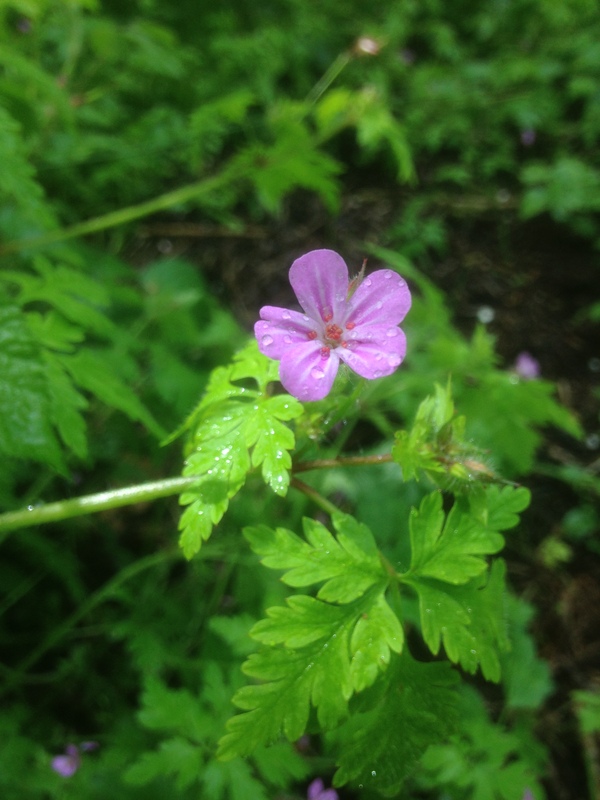 Herb Robert prefers woodlands but is found in many locations and can also be epiphytic (a plant that grows on another plant but is not a parasite). When crushed it has a very unpleasant smell and for this reason is also known as ‘stinking Bob’. 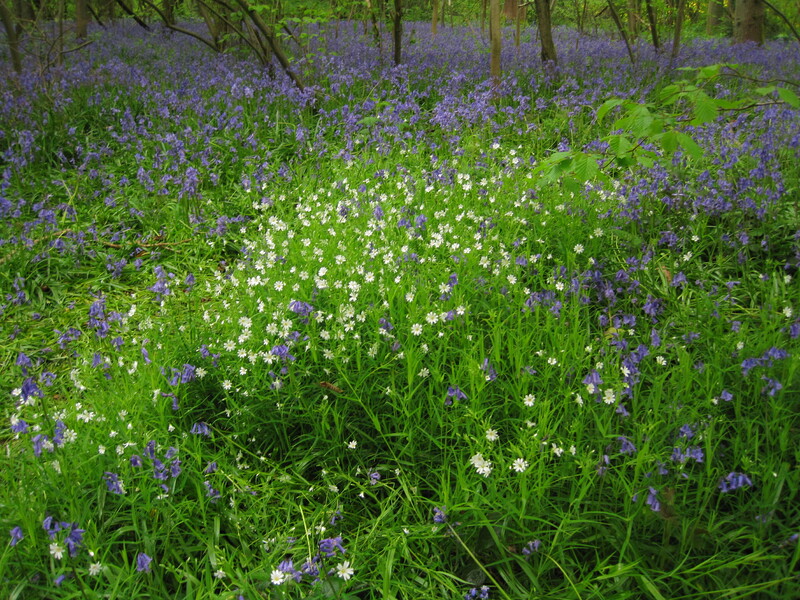 The unpleasant smell works as a repellent and is often left un-grazed by deer or rabbits for that reason. The seeds spread by sticking to passing animals (or humans) or by the plant ejecting the seeds up to 20 feet away. 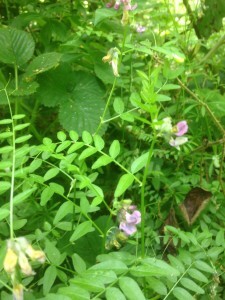 As we started our walk back to ‘HQ’ we noticed the vetch growing along the rides. I didn’t realise there were so many different species and looking in my trusted book “Wild Flowers of Britain” by Roger Phillips, I think it’s bush vetch, Vicia sepium. 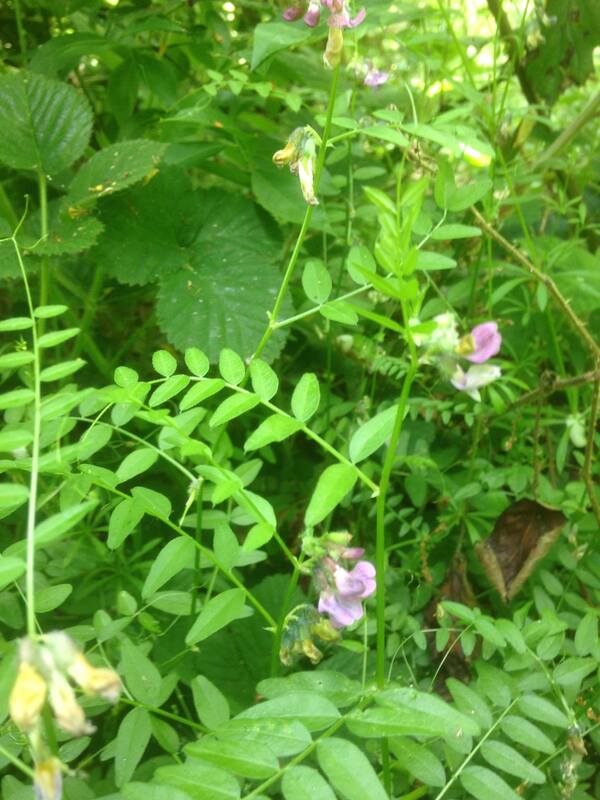 Vetch is a climbing perennial and a member of the pea and clover family (legumes) which fix nitrogen into the soil. Vetch also attracts ants that gain sugar from the plant, and in turn protect the vetch against aphids and other predators. This beneficial relationship is known as ‘mutualistic’ and research has shown that vetch with ants are healthier than vetch without. I can’t remember at what point of the tour we crossed the stream, but I lost my footing and fell on my backside, slipping down the bank in true style. Highly amusing and I still have streaks of mud on my jacket as evidence. 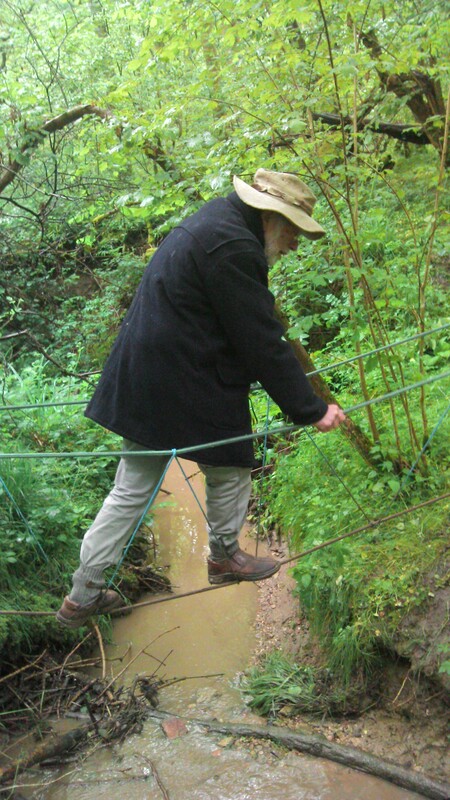 On the return crossing Philip gave me a choice of using the rope bridge or a wooden plank across the stream. Now normally both would appeal to my sense of adventure, however, due to my earlier slip I eyed them both suspiciously. Eventually I opted for the rope bridge. I handed Philip my bag; I didn’t trust myself not to fall again and wanted to hold on with both hands – tight! All was achieved without further drama and actually the rope crossing is fun. 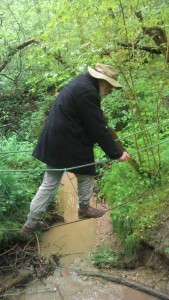 The photograph shows George Solt crossing the bridge and making much lighter work of it than I did! 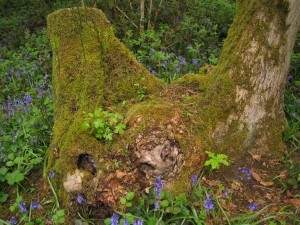 And finally, we stopped to admire a coppiced ash stool with oak, hawthorn and maple growing on it. 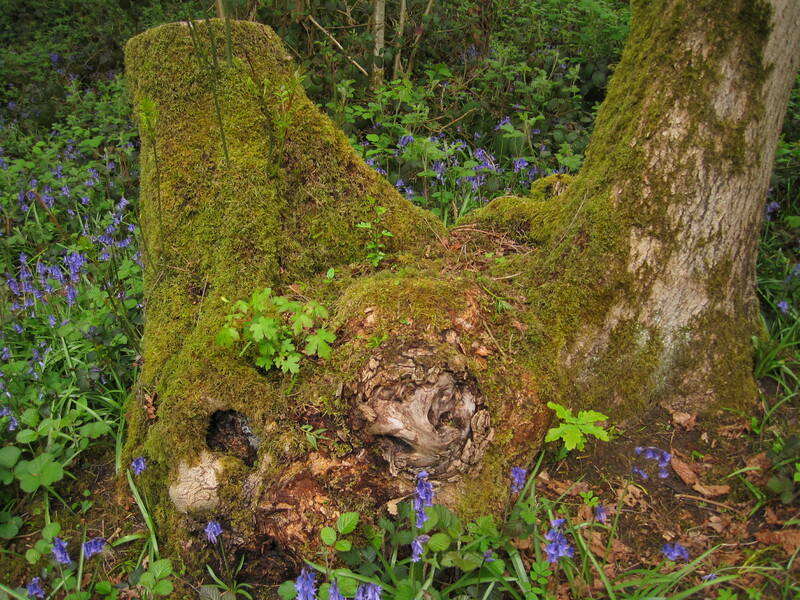 As with many ancient woodland trees, this old stool was covered in moss which plays a very important role in woodland ecosystems. Mosses along with liverworts (known together as bryophytes) are two of the oldest known land plants and I’m looking forward to investigating their function in the woodland ecosystem later in the year.